Ever been burgled in a hotel room? Imagine coming back from dinner to find your laptop missing. Or being unable to locate the wristwatch you last remembered ignoring on the bedside table while rushing out to the gym. From the bellhop who delivers or collects baggage, to the housekeeping staff that cleans the room or turns down your bed, the in-room dining staff, the laundryman, valet, the technicians who may visit to fix a faulty bulb, broadband connection, phone line or air conditioner, your room may be accessed by a wide variety of people. The greater the human interface, the more the prospect of human negligence and, of course, temptation. Let it not be thought that this piece is about encouraging you to treat hotel staff like suspected thieves. It is about staying secure. No hotel worth its salt would fail to put you on notice that it is not liable for any loss of your valuables. Worldwide, hoteliers enjoy legal protection that has evolved on the principle that while a person seeking shelter should generally not be turned away, hotels should have reasonable protection from unfair claims. If you were to read what you sign when you check into a hotel, or if you literally read the writing on your room’s wall, you would find the “fine print" on the subject. Numerous countries provide special legislative protection and impose special responsibilities on hotels. Others (such as India) have laws that enable hotels to contract such protection with the guests. Typically, the hotel would not be responsible for any loss of valuables from your room—either entirely, or above a silly value (for example, Australian $40 or about Rs1,350). Indeed, you would be put on notice that you could use a special safe deposit vault provided by the hotel to store your valuables—a theft from there alone would be compensated. If you have never used a safe deposit vault, you should know that these are cramped pigeonholes that can be opened only with at least two keys—one would be with the hotel manager and the other with you. They can almost never accommodate objects as large as laptops. Worse, you may have to declare the value of what you store, and the hotels would have the right to conduct their own valuation of the value of the stored goods. Picture spending this time, or having to wait for the manager to visit a distant safe deposit locker each time you have to access your vault. In short, this is no option for a road warrior. Therefore, the key to your safety is twofold—the leverage you get from the hotel’s need to be perceived as a safe place, and your very own sense of self-discipline, care and caution. Some time-tested rules can do the trick. First, it is a good idea to carry your laptop bag yourself and leave the heavy stuff to the bellhop—this would minimize valuable stuff lying unattended in publicly accessible and vulnerable places such as hotel lobbies. Second, check if access points in your room are secure. Room access can often be had from a variety of points—a neighbouring room, balcony door, windows with ledges, and obviously, the room doors (some suites can have more than one door). 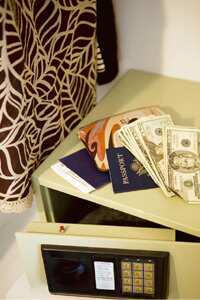 Third, make use of in-room safes. All self-respecting hotels have them and the safes can take in a fair size of contents. In-room safes are an effective security measure—particularly for that quick gym visit, or shopping trip before check out. However, using your date of birth as the digital key is a bad idea. Worse is using your room card as the key (some safes can be operated with the swipe of any magnetic card). Fourth, be nice to hotel staff. Across the globe, they are mostly good human beings, trained to put up with virtually every sort of nonsense. However, abusive ill-treatment of such a one-sided power equation could tempt even a saint to harm you. Finally, the simplest—and my favourite—measure: Use the “Do not Disturb" door sign liberally, even when you are not in. No hotel staffer anywhere in the world is allowed to enter a hotel room that has this signage, unless supervised by security guards. You may undeniably garner a reputation among colleagues. It is a small price to pay for an important measure of added safety.